Reprinted from the Etsy blog with permission under the Creative Commons license. Tell us about your previous working situation and how you discovered Etsy. 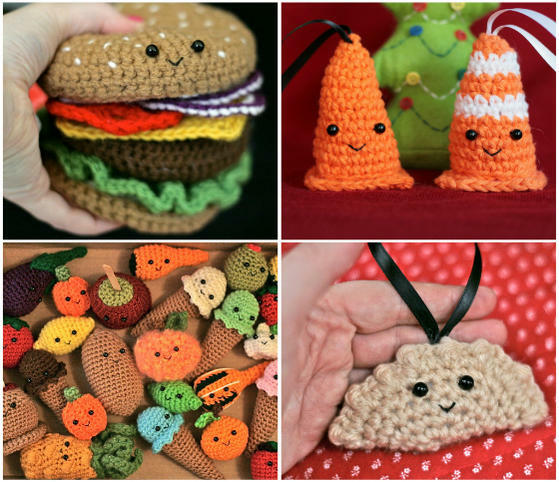 I make an array of toy-size smiley and frowny crocheted foods, common objects and creatures. I also make owl soaps that come with mini crocheted scarves. EternalSunshine grew out of a time that was anything but “eternal sunshine.” A year and a half after I graduated from college, I was diagnosed with a severe form of the chronic autoimmune digestive disease, ulcerative colitis. At the time I was living in New York City, working in museum education and public programs while also dabbling in nannying. Because of my bad health, I was eventually forced to leave all those jobs and live primarily a house-bound existence. My live-in boyfriend, then a full-time web developer at a NYC blogging empire, was very tech-savvy and was aware of Etsy, which was only a year old. He knew I lived and breathed everything craft as a kid and encouraged me to revisit those creative skills. Crocheting was one of the few crafty skills I had never attained, and in those early days of browsing Etsy, I kept coming across smiley “amigurumi.” I wanted to master crocheting, and I literally and bitterly said to that boyfriend, “If I’m going to be twiddling my thumbs indefinitely, I’d better as **** have something to show for it.” So, from the confines of my bed and numerous medical environments, I taught myself to crochet. At first, I sold a variety of crafts in my shop: origami envelopes, cookies and earrings, but I quickly settled on crochet. Tell us about your shop and the idea behind it. The name of my shop refers to the Alexander Pope poem, which I had studied in college, and the Charlie Kaufman film it inspired. Both the poem and film address the idea of forgetfulness as a way to deal with life. “EternalSunshine” was also meant to be tongue in cheek, because I was so sick and pretty darn miserable. Since I had a love/hate relationship with food (and life! ), I started creating patterns for “frowny foods,” foods that were exposed to high heat like roasted marshmallows. 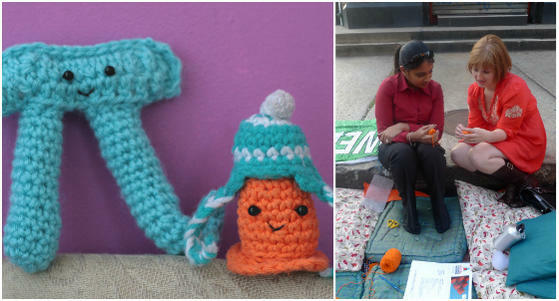 I was positively addicted to crochet and expanded beyond frowny foods, making deflated balloons, happy peas in a pod, Christmas ball ornaments, clementines, silver-lined clouds, and anything else my customers wanted. There were a lot of custom requests! As part of my listing description, I usually included some kind of personal story — the “why” behind the item, which again, goes back to my teaching roots, those storytelling, imaginative, and explaining-everyting elements. In hindsight, I realize that I was creating this little world that replaced the one I had when working with children on a daily basis, both full of stories, socialness, emotions, excitement and adventure. What steps did you take to prepare for transitioning into full time Etsy selling? For better or worse, not many! Etsy becoming more of a full-time gig was not exactly planned. For many months and even the first couple years I considered it a hobby to keep me busy until I got better and could return to teaching. Well, I never got better, and my hobby turned into a business almost without me realizing! In the early years of EternalSunshine, I also had a bunch of writing/blogging/social media gigs, so it only became more full-time in the last year and a half when I moved back home for health reasons and didn’t have those writing gigs that were NYC-specific. 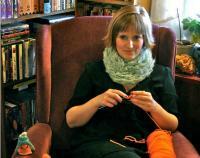 What is your favorite part of the process in crocheting? I love all of it! I truly love getting custom requests from customers that I call “crochet challenges,” turning their little yarn dreams into realities. It makes the process of crocheting the same thing over and over so much more interesting, personal, creative, entertaining and collaborative. For instance, when I was still in NYC, a prominent fromager there asked me to design a line of smiling gourmet cheeses, so I met her and some other cheese folks in the process. Teachers have requested objects to represent the vowels to use in preschool classes and construction and transportation-related companies will adopt my crochet safety cone as their mascot. What are your best marketing tips? This may seem really obvious, but you know how for brick-and-mortar businesses, they say, “Location, location location!”? I think for Etsy shops, that simple but vital concept should be either “Tags, tags, tags!” or “Photos, photos, photos!” “Tags” because that is one important way of finding you in the sea of sellers and photos because they affect how people instantaneously react to your shop and goods. In both cases, obviously your product or service needs to somehow be desirable and sustainable, but words and photos will go a long way, especially if you are just starting out. Check out your Shop Stats to see how browsers and customers arrive at your shop. I also advocate spreading the word about your shop merely by word of mouth. I used to be more active in the craft blog scene, but letting friends and family know about your business can go a long way. What’s been your most popular item or line to date? My Snow-Proof Safety Cone (and his many Safety Cone friends) has quite the following and he’s the only one of my creations that can boast a Facebook page and a prime spot on my nightstand. I posted the pattern for him on my blog a while back and for whatever reason it really resonated with people — there are almost 100 comments! Snow-Proof Safety Cone came into existence when I was living alone for the first time during a NYC winter. I started taking pictures if I was out and about with SPSC (for short!) in the same vein as the gnome in the movie Amelie. When I moved back home to Pittsburgh, I made pierogies, because this is very much a pierogi town. They have been ridiculously popular, to the extent that in the year and a half I’ve been back here, I think I’ve sold 300-400 on Etsy and at a shop. That’s almost a pierogi a day! Made any business mistakes you regret? I can’t say I regret much in regards to my Etsy shop other than little snafus like printing one side of two-sided business cards upside-down. There are probably things I should regret — like particular instances when I said no to bigger, more corporate opportunities — but I have little desire to grow the business beyond my own two hands. What’s the hardest part about running your own business? It was always hard for me when really sick and/or hospitalized to make the practical decision to cancel orders and close down my Etsy shop, to know when I had to stop creating for the time being. I lost my sense of purpose and identity, feeling like I failed and solely existed as a sick person. I also felt like I was letting people down. My doctor, all serious and blunt, would respond with something like, “Imagine how many people you are going to be let down because you ignore your disease and die.” It’s hard to find a balance between all of life’s responsibilities and know when to take a break to tend to other things. What do you enjoy most about not having a day job? What is the most exciting thing that has come out of selling your designs through Etsy? Books! Selling my things on Etsy is directly responsible for me becoming involved in co-editing and co-authoring craft books! Thus far, I have two titles under my belt, Witch Craft and Microcrafts, both published by Quirk Books and distributed by Random House. I’ve also made crafts for Better Homes & Gardens for their Halloween segments on The Today Show, designed for fiber magazines and contributed to the Photojojo book and a Barnes & Noble book/kit entitled Yummy Crochet. Again, I never would have imagined that picking up a ball of yarn and opening an Etsy shop could lead to such things! But, outshining perhaps even these book, magazine, and TV accomplishments has been the ability to make a living (or part of a living) while maintaining a desire and will to live in spite of being dealt a rough hand. Sometimes I think I owe Etsy my very life and I say that in the deepest, most sincere way. In 2010, when I was essentially succumbing to my disease, I had to have my colon surgically removed and decided to design and crochet a “frowny colon,” which I guess was my creative way of dealing with this devastating culmination of being sick for six years. I listed it on Etsy and I got emails from all over the world, from other people who also had ulcerative colitis. They would tell me their story and thank me for making them laugh. Craft can be so powerful! What advice would you give someone considering a similar path? Be realistic about the financial challenges that come along with running a creative business full time, especially if you don’t have a spouse, a savings account or a trust fund to fall back on. I knew nothing about small business loans back then or buying in bulk or how to be an entrepreneur in general, and though it didn’t stop me from succeeding, if you have the luxury of doing research about the market you are entering and all the number-crunching, do it! And read this Quit Your Day Job column here on Etsy. What goals do you have in store for the future of EternalSunshine? I’ve been contemplating the future of my business a lot lately, as I just got through a year of three major abdominal surgeries and difficult recoveries, and I can finally boast some health! It has been a long seven years, and though I won’t ever quite be 100% normal, I will no longer be chronically ill. I can’t imagine working and creating without all the health hurdles, so it’s a really exciting time for me! I would like to teach kids, especially teenagers, how to crochet and knit, but also give them the pragmatic business tools to be able to sell their wares if they want to. Foster Pride’s HandMade program in NYC is doing something similar, where a bunch of Manhattan group home teens run a crochet Etsy shop! Imagine the possibilities of having collectives like that all over the country. I would love to combine my former career of teaching with my new career of crafting and crocheting in this way. Lastly, I would really like to publish a book of my crochet designs. This book would not only include the crochet instructions, but the stories from customers that I have collected along the way, so that you can “read” the book as well as create from it. Additionally, I have an idea for children’s books based on my Safety Cone Adventures photo-and-story series, but I want it to be thought-provoking enough for adults, like Dr. Seuss and Leo Lionni books or the Pixar films. When life hands you lemons, don’t be satisfied with just making lemonade. Instead, build the most fun, creative and successful lemonade stand that you can possibly imagine! Fabulous article! Very inspiring, thank you for posting! What an amazing lady and wonderful story! What a fabulous article it really is wonderful what you can accomplish with crochet determination to think outside the box. A wonderful idea to keep body and soul going through so things laid down in your path. You meet wonderful people and keep coming up with new ideas too. I truly enjoy the story love the idea having a shop thought about but never got past that. Thank you for sharing your story it really made my day as I have many medical issues going on my self and crochet does keep me going and reading the forum here too makes me feel good to that there are good things happening and I enjoy reading about them. Again thank you for sharing your story.